Remember the time it all came down to you? Your friends or teammates waiting anxiously to see if you would be the one to push your team to victory? You could feel the sweat falling down your face and your heart pounding right out of your chest? That’s the pressure that freshman, Rrezart Cungu, felt fighting for the Men’s Tennis ITA Kickoff Title. After an intensely battled season last year, the top-ranked Men’s Tennis Team was ready to defend their title as the No. 1 team in the nation. Lead by head coach Tony Bresky, the Demon Deacons were more than prepared for a season of incredible tennis, starting this year with the ITA Kickoff Title. The winner of the tournament is guaranteed a spot in the ITA National Indoor Championships in Seattle, WA, and the Demon Deacons were eager to earn that spot. As the weekend began in the Wake Forest Indoor Tennis Center, the team took on the Monarchs from Old Dominion, which was quite the match for the Demon Deacons. Hours upon hours of tennis resulted in a 4-0 sweep for Wake Forest. The Monarchs gave the Demon Deacons a tough battle in doubles, taking the first match at the No. 2 spot, while the Deacs clinched the No. 3 spot, forcing the point to be decided by the last match on at the No. 1 spot. Senior Skander Mansouri and red-shirt senior Christian Seraphim brawled in the match of the day, fighting off a match point in the tiebreaker to clinch the doubles point 8-6, to put the Demon Deacons up 1-0. From there, the Deacons took this confidence to the singles round, where they swept the Monarchs in a 3-0 victory with wins from freshman Bar Botzer at No. 5 junior, Petros Chrysochos at No. 2, and Mansouri at No. 3. The weekend continued with the team taking on the Vanderbilt Commodores in the next round. The Commodores took a commanding lead in the doubles round, defeating the Demon Deacons at the No. 1 and No. 2 doubles spots to put them down 0-1 going into the singles round. Bresky knew his team would have to push the momentum heavily in their favor to come out on top. Botzer took a quick 6-3, 6-2 victory for Wake Forest, but Vanderbilt’s Cameron Klinger and George Harwell answered with a victory at both No. 2 and No. 6, pushing the Deacons further down the hole, 1-3. 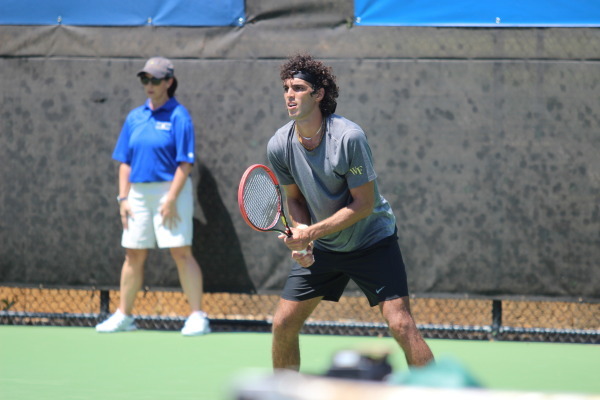 Luckily, Mansouri and sophomore Borna Gojo claimed strong victories at the No. 3 and No. 1 spots, respectively, to bring the score to 3-3, putting the deciding match in Cungu’s hands. Just recently transferring to Wake Forest this spring semester, from Cungu was the new freshman to our men’s team, but not a novice when it came to the pressure of a college match. Cungu received a tough battle in the first set, dropping it 1-6 to the Commodores’ Billy Rowe, but he was not going to let that hurt his confidence. Cungu fought valiantly in the second set, winning 6-4, forcing the match into a third set. Cungu and Rowe clashed for what seemed to be an eternity until Cungu prevailed in the third set tiebreaker 7-4, leading the Demon Deacons to a 4-3 victory over the Vanderbilt Commodores. Cungu’s victory sealed the Deacon’s spot in the Indoor Championships held Feb. 16-19 in Seattle, Washington. Until then, the Deacs will train in preparation for their travel match in Stillwater, OK, to compete against the Pistol Petes of Oklahoma State on Feb. 11th at 2:00 p.m.